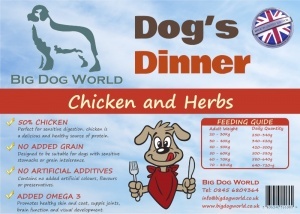 Dogs Dinner with Chicken, Sweet Potato and Herbs is a delicious recipe that your dog is sure to love. With 55% Chicken and added Omega-3 for healthy coat and joints. 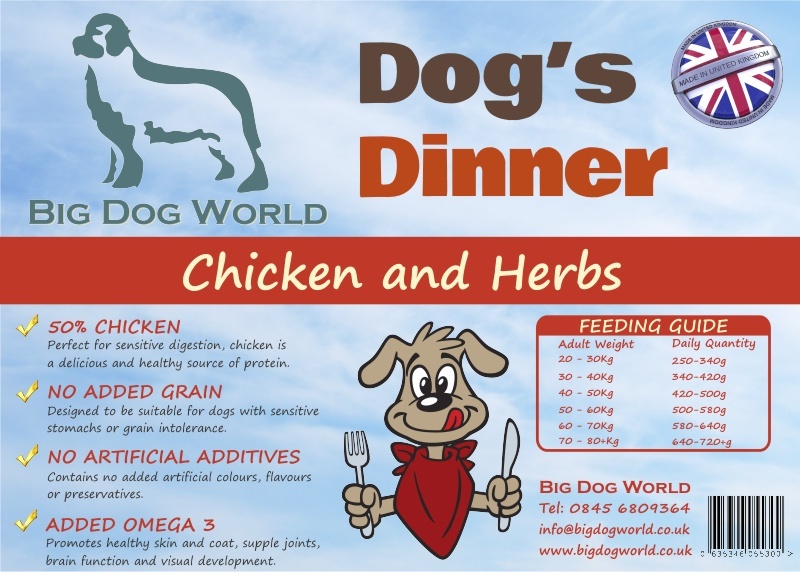 Dogs Dinner is made in the UK and contains no added grain making it suitable for dogs with sensitive digestion or grain allergies. It also has a high meat or fish content with no artificial additives such as colours or preservatives. Chicken 55% (including 31% Freshly Prepared Chicken, 21% Dried Chicken & 3% Chicken Stock), Sweet Potato (26%), Peas, Potato (5%), Beet Pulp, Linseed, Omega 3 Supplement, Vitamins & Minerals, Vegetable Stock, Marjoram, Basil, Oregano, Sage, Thyme, Parsley, Prebiotics: FOS (92 mg/kg), MOS (23 mg/kg).